Ronald Takaki’s book Hiroshima: Why America Dropped the Bomb explores the decision-making process that led up to America’s se of nuclear weapons against Japan in World War II. A professor of Ethnic Studies at the University of California at Berkeley, Takaki has published much on multiculturalism and ethnicity, especially in terms of American history; his earlier works include Strangers from a Different Shore and A Different Mirror. As in these preceding books, Takaki applies a critical perspective toward race and culture in America with Hiroshima. Takaki argues that the decision to drop atomic bombs on Hiroshima was driven by strategic and diplomatic concerns, the phenomenon of anti-Japanese racism in the U.S., and the psychology of key American leaders, with special emphasis upon President Harry S. Truman’s psyche. To advance this thesis, Dr. Takaki uses a variety of historical sources that open up views into the minds of leaders, scientists, and average Americans at the time of the bombings. 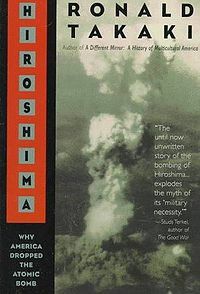 In the early pages of Hiroshima, the author brings up a quote from Secretary of State Henry Stimson to explain this approach: “No single individual can hope to know exactly what took place in the minds of all of those who had a share in these events…” However, Takaki is reaching for the best approximation of that elusive understanding with this text: “An effort must be made,” he insists, “to learn what was in their minds. Personalities mattered, especially in the decision to drop the bomb.” Operating on this assumption, Takaki draws on many different types of documents to explore the minds of key players like J. Robert Oppenheimer, Stimson, and especially President Truman. Resources used in Hiroshima include personal letters, diaries, memoirs, and articles published by the individuals themselves after the fact. With Truman, Takaki reaches far back to letters written during the future President’s courtship and his later reminiscences of childhood experience to illuminate Truman’s deep insecurities. Harry Truman’s sense of inadequacy played a part in his leadership style, Takaki claims, compelling him to be resolute and unblinking, and evince confidence in crucial, uncertain decisions (including the atomic bomb issue). Takaki also collects comments and offhand remarks from the President’s life to illustrate his racist tendencies, arguing that Truman’s prejudice made it easier to destroy Japanese life indiscriminately with nuclear weapons. The theme of racism is key to Takaki’s analysis. He not only examines Truman’s own prejudice; he also looks at the larger cultural context of the time period. Referring to popular films of the time and memories of average people, the author shows how a general hatred of the Japanese provided a cultural environment in which outright annihilation of a people was conceivable. Takaki claims that that atomic bombing of Japan actually derived from the tradition of Eurocentric racism and oppression that stretches back to the initial colonization of America. In his view, this tradition leads up to the particular hatred of Asians in America, especially on the West Coast, and the period of fervent outrage that followed Pearl Harbor. Dehumanizing the Japanese in culture and society made them likelier targets for atomic destruction, Takaki argues. Aside from exploring the personal and cultural psychology of dropping the bomb, Takaki also analyzes a series of standard arguments for the use of atomic weaponry against Japan. One chapter, for instance, is devoted to the idea of saving “half a million American lives” by opting for atomic bombing over an invasion of Japan. Takaki states that an invasion would have been less costly than publicly claimed by Truman, and was not even necessary since Japan was known to be on the verge of surrender. The author instead defines the “necessity” of bombing not as an immediate military need but a long-range strategic goal – the “overriding concern” of managing the Soviet threat after the war. Takaki portrays government leaders as highly concerned with using their new weapon to frighten Stalin, keep the Soviet Union out of the Pacific theater, and demonstrate American power. Takaki looks with special emphasis at the tense negotiations of the Potsdam Conference to demonstrate the crucial place that nuclear technology occupied in dealings between the U.S. and Soviet Union. This page was last modified on 30 June 2012, at 20:03.